Posted on December 8, 2012 by Brendan Jones Posted in Pedagogy, teacherstuff	. My first reaction was that pretty much all the concerns the author mentioned could be easily argued as pitfalls of any testing, not just fitness or body related. Why don’t people consider testing like NAPLAN, or the HSC, or just your generic end of unit summative tests for reports in the same light? What makes testing the body and reporting the findings any more insensitive than testing literacy or numeracy and publishing the details for that? Conversely, surely the arguments used to justify NAPLAN testing and reporting for literacy and numeracy must hold for weight and physical fitness testing and reporting as well? Exposure of problem areas, targeted funding to address shortfalls, support for the kids that really need it? Ahh. We’re worried people will notice and start to compare each other. 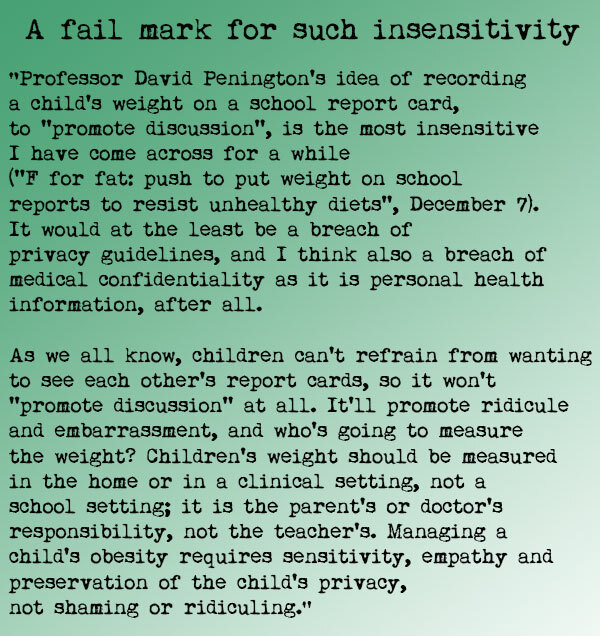 “As we all know, children can’t refrain from wanting to see each other’s report cards” tend to suggest the author knows it’s already happening now. Just quietly, doesn’t My School do that now? To me you can’t have one sort of testing that’s preferable to another sort. Testing is…testing. And lets face it, testing is usually deployed in education as a blunt instrument to discriminate between candidates and often results in winners and losers, no matter how much chocolate you put on the broccoli. PE teachers often resort to fitness testing as a well intentioned way to add a “personal best” aspect to the movement studies they program, but ultimately these tests usually end up in comparisons by students and staff. In doing this we can often find ourselves creating a comparative culture that can be negatively reinforcing and detrimental to any lifelong physical activity aims we might have for the general student population. Additionally, the idea that competition (physical, intellectual or whatever) is “character building” and important plays it’s part in testing being poorly used as an assessment tool. We face many examinations of our skills and character throughout life. Not one at the end of it. We should be showing kids this. Testing in any realm needs to be carefully thought out. If we’re honest we’ll explain that it’s about comparison. And that it’s one dimensional. And the results have a shelf life. I’d prefer to find ways not to have that conversation at all in schools. Full stop.